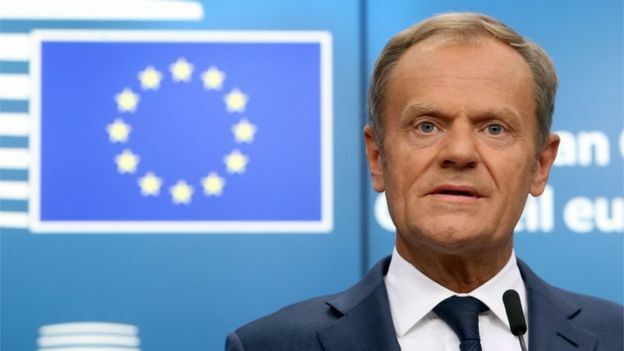 Donald Tusk has issued a "last call" to the UK to "lay the cards on the table" if a Brexit deal is to be done in time. The European Council president said the "most difficult" issues were unresolved and "quick progress" was needed if agreement was to be reached by October. Talks continue over the terms of the UK's withdrawal from the EU in March next year. What happens to the Irish border remains a sticking point. The UK says both sides want to see a "faster pace" in talks. But Prime Minister Theresa May has been unable to say much new at this summit - the last one before October - because she has yet to get her cabinet to agree on a blueprint for the UK's future relationship with the EU. They are due to meet at Chequers next Friday, in what has been billed as a make-or-break meeting. Mrs May has said the UK will then publish a White Paper setting out "in more detail what strong partnership the United Kingdom wants to see with the European Union in the future". Chancellor Angela Merkel said Mrs May would "come to Germany and we will have a longer debate on this", once the proposals were published. At the close of the summit, Mr Tusk told reporters there was a "great deal of work ahead" on Brexit and the "most difficult tasks are still unresolved". "Quick progress" was needed if a deal was to be reached at the next summit. "This is the last call to lay the cards on the table," he said.